Over a lifetime of chocolate cake eating and baking, I have encountered far too many disappointments. From dry to not chocolaty enough and every permutation in between, no chocolate cake (except for one at a restaurant) has met with my expectations. Nearly two years ago, in honor of my grandfather's 98th birthday, I searched extensively and found a recipe for a cake that bloggers proclaimed to be the very best. It received so many accolades I felt it had to be the one. But it too let me down. It had a fair amount of oil in it when I prefer butter and it was so moist that it had horrible sticking issues. Despite its shortcomings, it did pack quite a chocolaty punch and I wouldn't turn it down but it still wasn't the one. And so when Izzy requested chocolate cake for his birthday, my quest continued. It ended in Alice Water's newest cookbook, The Art of Simple Food. Her chocolate cake recipe contained two crucial ingredients, butter and actual chocolate, instead of oil and only cocoa. When I googled the recipe I found it on another blog called One Hot Stove and it was made with the perfect addition, a raspberry filling. Exactly what Izzy had requested. Now mind you, Izzy was not content with a standard layer cake. He wanted a "meteorite" so I baked the entire recipe in a metal bowl. It came out somewhat dome-shaped and I was able to slice it and fill it, before frosting it with chocolate ganache. I decorated it with a simple silver spaceship, not as frou-frou as I had hoped but still special. I served it surrounded by miniature vanilla cupcakes topped with the same chocolate ganache frosting. As I sliced it up after the birthday song, I was ever hopeful for just the right flavor and texture. And guess what?? This cake had it. It was smooth, chocolaty goodness with luscious raspberry inside. Thanks to Alice, I now have my go to chocolate cake, just right for birthdays and other occasions. Your meteorite cake is adorable! 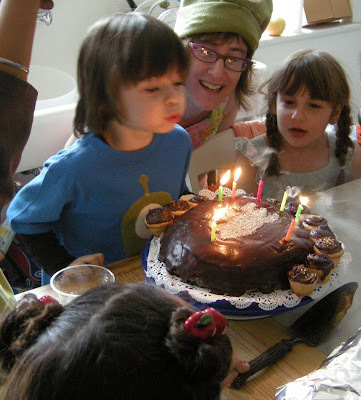 I too am still in search of THE chocolate cake -- every year when the preschooler wants chocolate on bottom, white on top for her birthday I groan a silent little groan, because it's just SO much easier and more reliable the other way around. I actually do like that other recipe from Epicurious quite a bit, even though once I underbaked it the tiniest bit and it completely collapsed into pudding. Alice never lets me down, though, so I'm going to have to try this recipe! Carolyn: Thanks. The meteorite cake was a tad mishapen but definitely cute in its own way. Definitely give Alice's cake a try. Would love to hear how you think it compares to the Epicurious one.